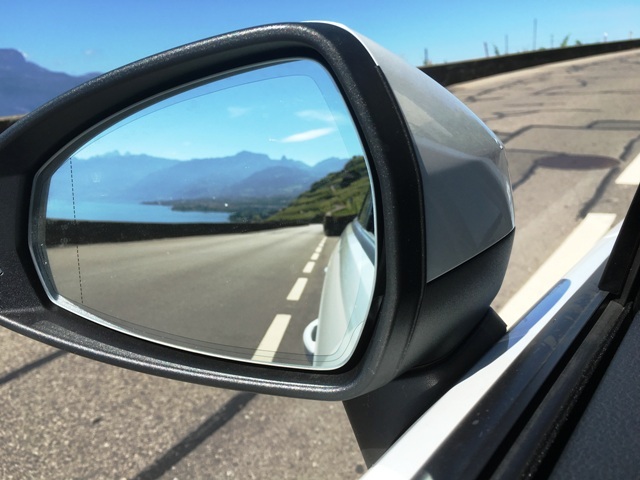 Andy Mossack continues his iconic drive on the Grand Tour of Switzerland second leg we pick up his story in Ascona, deep in Switzerland’s Italian speaking region and journey around to Neuchatel. After a memorable dinner at Eden Roc’s La Brezza restaurant, and some entertaining jazz after, we are back on the Grand Tour of Switzerland second leg for a lengthy stretch retracing our steps to Bellinzona before turning north west towards the St. Gotthard Pass. 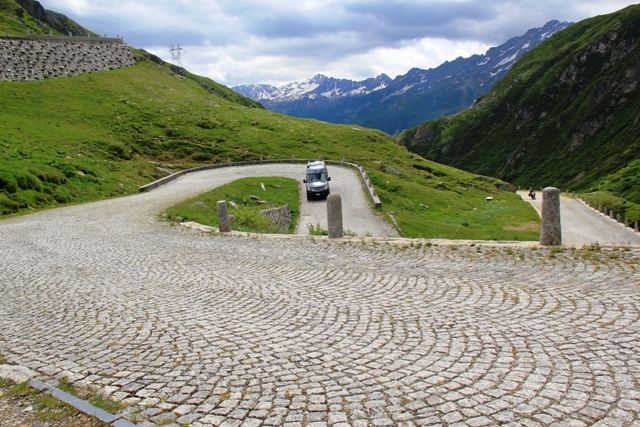 A Grand Tour highlight is approaching as we reach Airolo, bypassing the Gotthard Tunnel for the ancient cobblestones of the Tremola, Switzerland’s longest landmark. With a 900 metre elevation, 37 hairpin bends and several million cobblestones, this 13k mountain track was the original route of the horse drawn carriages as they travelled over the pass, a feat still replicated today by a daily horse drawn tourist coach during the summer months. 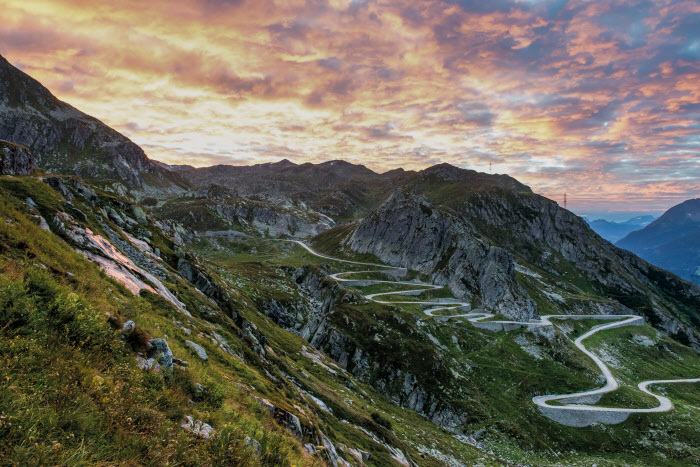 With just a couple of bikers for company, we take the twisty Tremola and emerge at the top by the side of the St Gotthard Hospice. Lots to see up here; the Sasso San Gottardo is a grim reminder of Switzerland’s war time fortifications,. A vast tunnel network, the fortress home to the Swiss army for years. The old mule drivers’ village at Hospental, the Devil’s Bridge across the Scollenen Gorge, and on to Andermatt and James Bond Street, the twisty road to the Furka Pass made famous in the Bond movie Goldfinger. 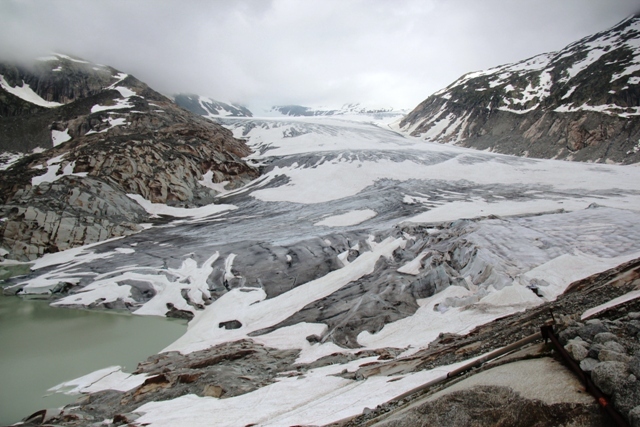 Just past the Furka we have to stop and gaze in wonder at the legendary Rhone glacier, the source of the great river, just by the Belvedere Hotel. It’s well worth the small admission fee to walk down to the glacier and enter the blue ice tunnel and cave which has to be re-cut each year, adjusting for the glacial movement. Now we’re in the Valais canton we’re driving in a straight line along the Goms valley to Visp, where the Grand Tour splits once again. A spur tracks south, down to Zermatt and the legendary Matterhorn, but we continue west with a distinctly French flavour towards Martigny, the vast cathedrals in the sky gradually turning to fertile meadowlands as we pass Sion following the path of the ever-widening Rhone. Soon the Grand Tour of Switzerland joins the Valais Wine Trail, endless vineyard balconies stretching as far as we can see. We’re driving through the vineyards now, the vines hugging the sides of hills drenched in the afternoon sun. 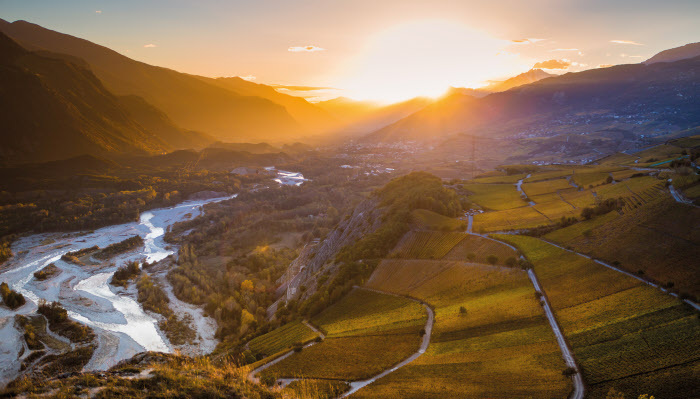 It’s late afternoon by the time we reach Martigny, a town renowned for the quality of its strawberries, apricots, grapes and asparagus. There is an interesting detour we could make here and go south to the Great St. Bernard Pass and learn all about the history of the wonderful St. Bernard dogs but we turn north, still following The Rhone river as Montreux is waiting for us on the shores of Lake Geneva in the canton of Vaud. We are spending two nights in Montreux to rest, relax and speak French, clasped in the welcoming arms and the yellow awnings of the famed Fairmont Montreux Palace. This legendary grand hotel is at the very epicentre of the Montreux Jazz Festival and things are gearing up with this year’s festival just a few days away. The tents and stages in front of our lakeside room window are dwarfed by the sheer magnificence of Lake Geneva, framed by her crown of peaks with Mont Blanc the jewel at the centre. We stroll along the lakeshore to find somewhere for dinner, passing Freddie Mercury’s statue, his fist raised high as he stands looking out over the lake. The casino behind, the scene of the fire which became the inspiration for Deep Purple’s classic hit Smoke on the Water. The morning is hot and sunny as we take a trolley bus along the lakeshore around to Vevey on our way to visit the newly opened Chaplin’s World. Chaplin’s family home for the last 25 years of his life is now a museum dedicated to the little tramp. 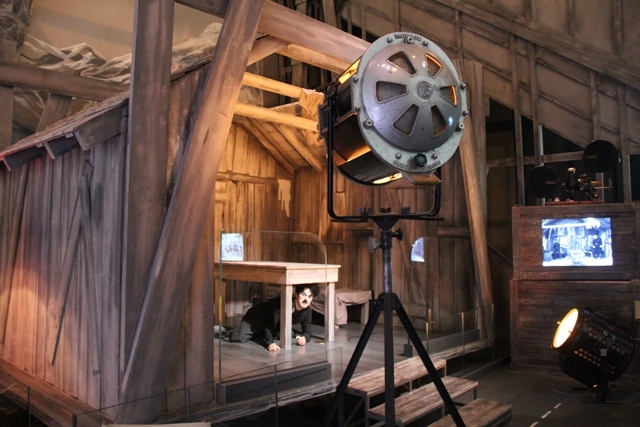 We stroll the house and gardens, walking in Chaplin’s footsteps and then explore the new studio complex where the sets of a number of his famous films have been recreated using his original blueprints. 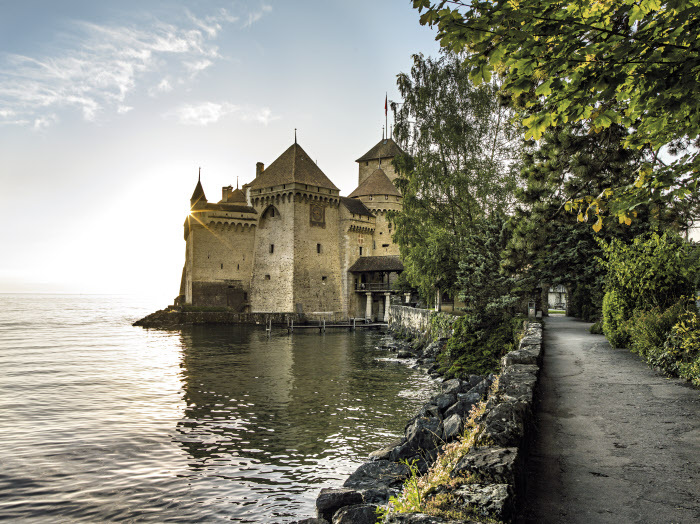 An afternoon walk around the lake to Chillon Castle is mandatory in Montreux. The 400 year old castle was once a home for the Savoy Counts and immortalised in Byron’s poem The Prisoner of Chillon. Back on the Grand Tour and we stop briefly back in Vevey to see the lovely old town main square and the lake promenade with its Chaplin statue and giant fork art piece sticking out of the water. Lausanne and Ouchy are next, the Olympic museum worth a visit as is the funicular up to the old town for a coffee. 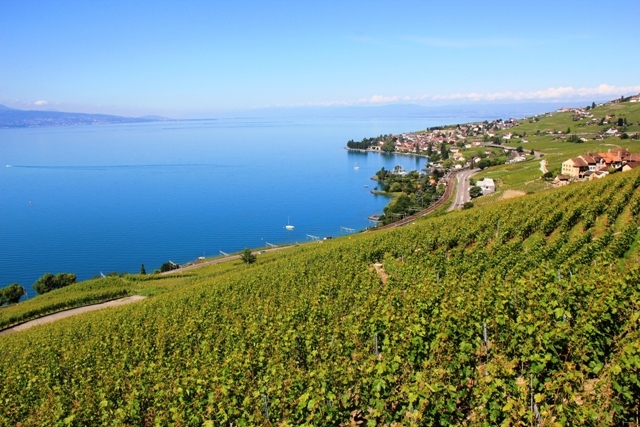 But we want to get over to the stunning UNESCO World Heritage vineyard terraces of Lavaux high above the lake. 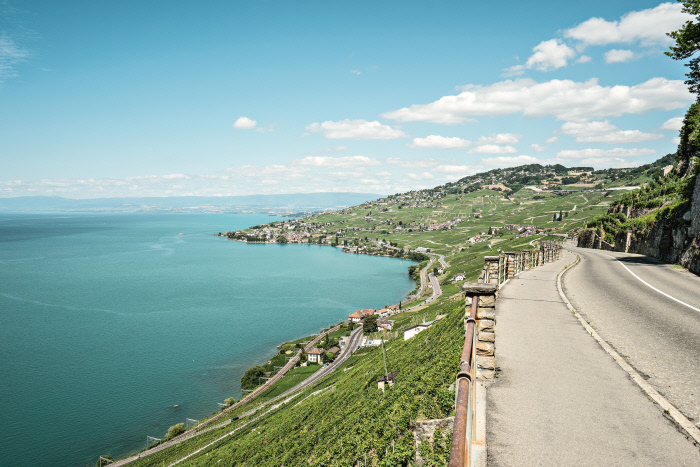 Not only is this a place for spectacular views back across Lake Geneva, but the narrow streets of the various wine making villages perched along the slopes such as Grandvaux and Epesses are so quaint and full of character. At St. George there is another Grand Tour detour down to Geneva, but we turn in and head for Jura and some more mountain air and national parks. Past Morges I have to stop in Biere for a beer, it would be crazy to miss this opportunity, the beer must be good! The Vaud canton spreads from Lake Geneva across to the mountainous Jura range and brings us to another lake, this time Lac de Joux where we stop for an outdoor lunch at a lakeside restaurant and enjoy the warm sunshine. This is the pine lined Joux Valley, home to many of the world’s finest master watchmakers such as Patek Philippe, Blancpain, and Piguet. Whilst we could dally in the health benefits of the thermal baths at Yverdon-les-Bains at the head of Lake Neuchatel we follow the Grand Tour as it turns left and climbs 500 metres towards Sainte-Croix, the town where music boxes were invented in 1796 and went on to become the world’s biggest manufacturer until the beginning of the 20th century. There are some spectacular diversions here along the Val de Travers including hikes to the Areuse Gorge and the towering cliffs over the Creux du Van abyss, described by some as Switzerland’s Grand Canyon. But we continue on, excited to be nearing our destination, the historic Beau-Rivage Hotel on the banks of Lake Neuchatel. The Beau-Rivage Hotel stands proudly next to the lake, a symbol of a bygone era, but following a renovation is now every bit the epitome of modern luxury lodging. 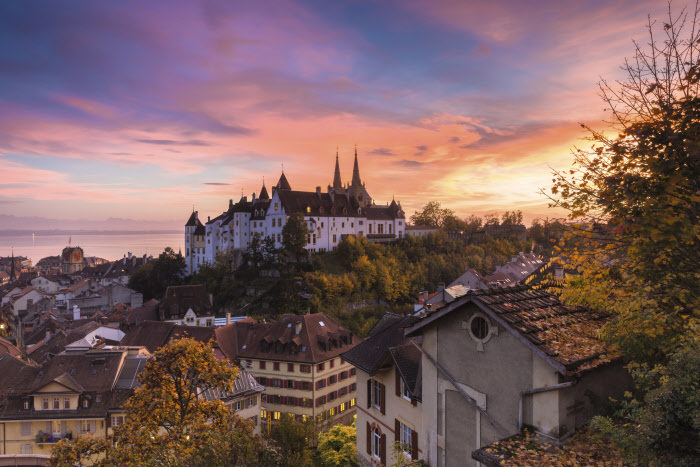 Neuchatel’s sandstone medieval old town is dominated by the spires and turrets of the castle and gothic church high up on the hill overlooking a town peppered with fountains and 18th century mansions. We just have time for a drink in the cafe laden main square before enjoying a memorable dinner out on the Beau-Rivage terrace. 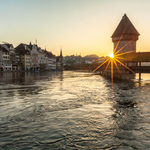 For more information, detailed map and a bespoke guide book on the Grand Tour of Switzerland contact Swiss Tourism directly. 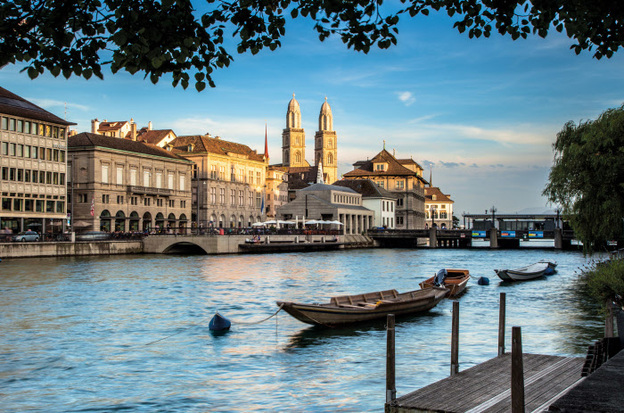 The Grand Tour of Switzerland passes through all of the country’s tourist regions as well as its four language zones, leading over five Alpine passes, alongside 22 lakes, to eleven UNESCO World Heritage Sites and two biospheres. It takes visitors through towns and villages, passing by artistic and architectural sites and offering natural and historic experiences and it is fully signposted along the length of the route. The Tour is also available as part of a bookable package.